• Mount the Nikon ES-2 Film Digitizing Adapter to the front of one of those lenses either directly (Nikon 40mm) or with one of the included stepping rings (Nikon 60mms). Note that lenses are not included with this rental. • Connect your lens + ES-2 to a Nikon DSLR. You can use any Nikon DSLR but it is designed specifically for pairing with the D850 because that camera includes a function to store negatives as positives, saving you a step in post production. If you pair this Digitizing Adapter with the 60mm f/2.8D or 60mm f/2.8G and a crop sensor (DX) Nikon camera, then the reproduction ratio will exceed 1:1 and you'll experience cropping. • Slide your film/slides into one of the included holders and start shooting. 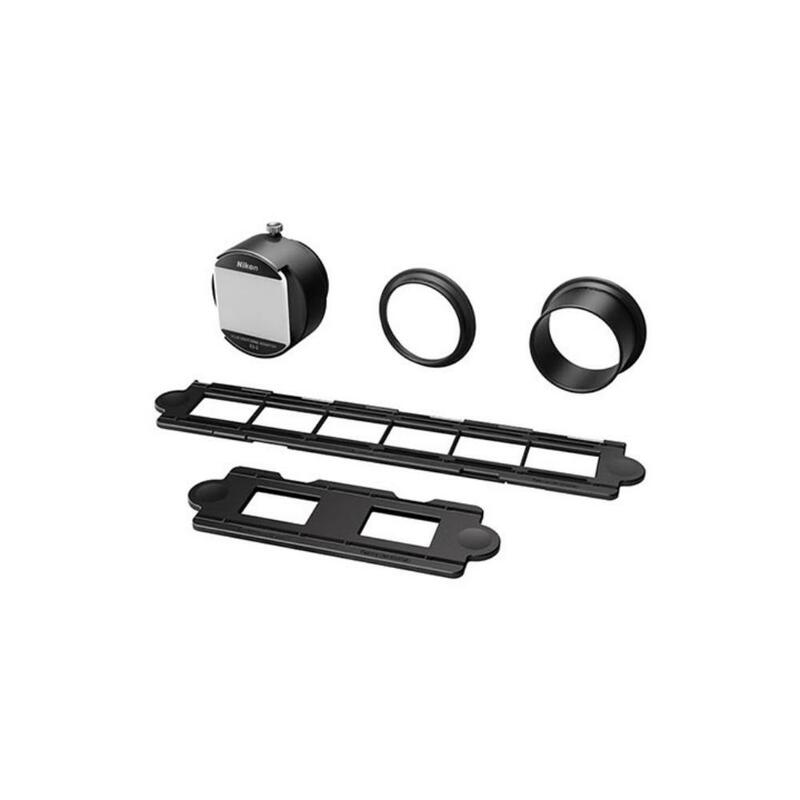 These holders will ensure the film stays taut while you digitize. Please note that when using the Nikon D850's function to automatically turn negatives to positives, the files are stored as JPEGS. If you don't want this, then shoot in RAW but you'll have to convert the negs yourself in post production. The Nikon ES-2 Film Digitizing Adapter is ideal for those who want to take advantage of the Nikon D850's high megapixel count and negative-to-positive feature to capture large-file, sharp, digital versions of their 35mm imagery. With the Nikon 40mm f/2.8G, you do not need to use any of the included adapter rings – the ES-2 will screw directly into the lens threads. • This Film Digitizing Adapter can actually be used on any Nikon DSLR. It is designed specifically for pairing with the D850 because that camera includes a function to store negatives as positives, saving you a step in post production. If you pair this Digitizing Adapter with the 60mm f/2.8D or 60mm f/2.8G and a crop sensor (DX) Nikon camera, then the reproduction ratio will exceed 1:1 and you'll experience cropping. • Please note that when using the Nikon D850's function to automatically turn negatives to positives, the files are stored as JPEGS. If you don't want this, then shoot in RAW but you'll have to convert the negs yourself in post production. • This Film Digitizing Adapter can be used with 35mm strips or mounted 35mm slides. • There is no built-in light source for this adapter. You will need to use it in sufficient natural light, a light box, or other light source that doesn't generate much heat.